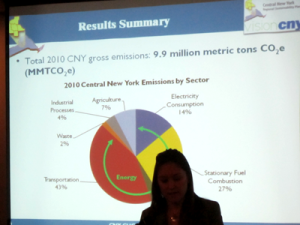 The Central New York Regional Planning and Development Board held its annual meeting on Wednesday, December 12th from 9:00-1:30 pm at the Doubletree Hotel in East Syracuse. The meeting featured a series of presentations by technical consultants assisting the CNY RPDB with the preparation of the Vision CNY Regional Sustainability Plan along with a traditional holiday luncheon that featured Dr. Bruce Bailey, President and Chief Executive Officer of AWS Truepower, as the keynote speaker and the annual presentation of the CNY RPDB Rhea Eckel Clark Citizenship Award posthumously to Mr. Walter Tennant, most recently Chairman of the CNY RPDB Board of Directors. 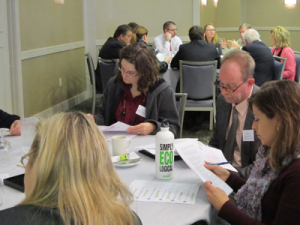 Participants had the opportunity to review and discuss the DRAFT goals, strategies, and project recommendations that have been developed in support of Vision CNY. The DRAFT documents are available for review by clicking here. Comments can be submitted by utilizing the contact us page, or by visiting the wikiplanning.org on-line participation site. Comments will be incorporated into the final plan document scheduled to be completed by January 31st, 2013.